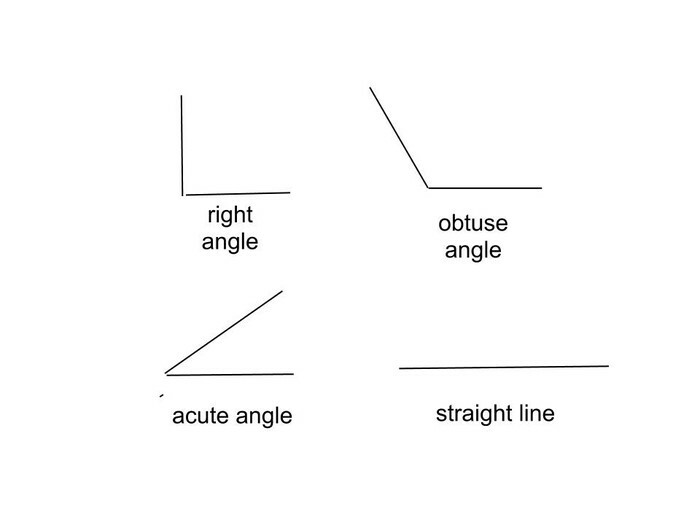 There are four types of angles, they are: acute,obtuse,right,and straight. The acute angle measures less than 90 degrees but, more than 0 degrees . The next one is the obtuse angle and it measures more than 90 degrees, but less than 180 degrees. Next, is the right angle and it only measures 90 degrees and nothing else. Finally, there is the straight angle and it is a horizontal line that measures 180 degrees. TeacherTube is an educator and student friendly site for sharing the best content for you class. There are six types of triangles. First, is the acute triangle. All angles have to be acute. 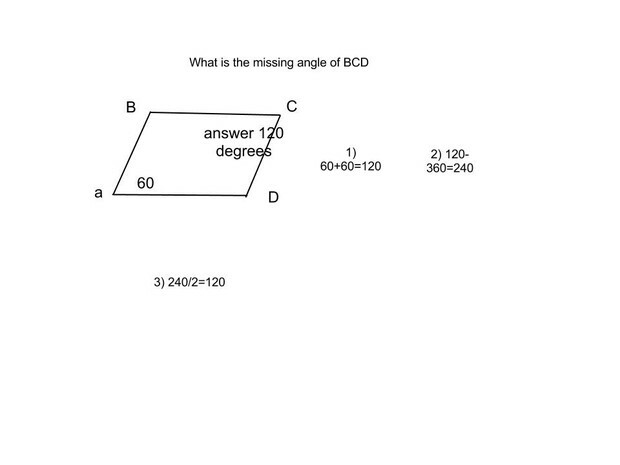 Second, is the right triangle and these angles must have one right angle and two acute angles. Third, is the obtuse triangle and it must have one obtuse angle and two acute angles. A scalene triangle has zero congruent sides and zero congruent angles. 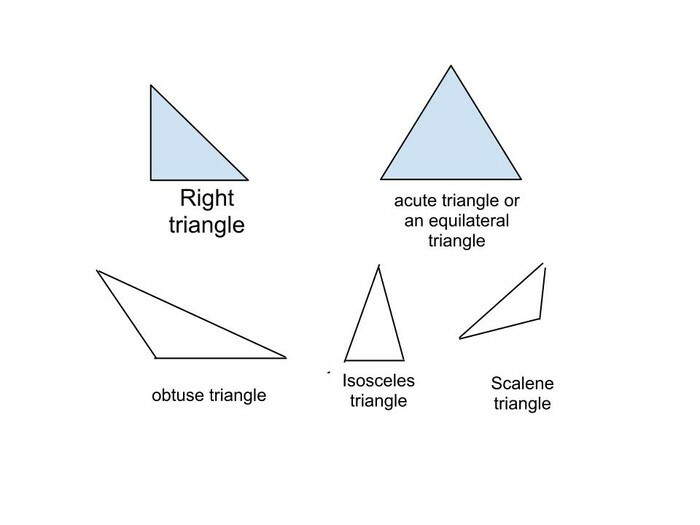 Isosceles triangles only have two congruent sides and two congruent angles. Finally, there is the equilateral triangle and it is perfect with three congruent sides and three congruent angles. There are 6 quadrilateral types: quadrilateral, parallelogram, rectangle, square, rhombus and trapezoid. A quadrilateral is a four sided polygon and the sum of all angles equals 180 degrees. A rectangle is a quadrilateral with opposite sides parallel, also all 4 angles are right and opposite sides are congruent. A rhombus has to be a quadrilateral,and all sides have to be parallel. Also all sides haves to be congruent,and opposite angles are congruent. Parallelogram has to be a quadrilateral like all the rest and also opposite sides congruent,opposite angles are congruent, and opposite sides parallel. Now a square is special because of course its a quadrilateral but all angles are right and opposite sides are parallel finally all sides are congruent. The last one is the trapezoid it is a quadrilateral and it has exactly one pair of parallel sides. I am going to give you an example down there below this. How to find missing angles in quadrilaterals and triangles are easy. First step is to look at the angle givin to you. Next step is to see if it is a quadrilateral or a triangle. If you found that out you can subtract the angle givin to you by 360 degrees if it is a quadrilateral or 180 degrees if it is a triangle If you got a quadrilateral that is a square then of course all the angle measures would be 90 degrees and if it is a rectangle all sides would be 90 degrees. If it is a rhombus then the sides that are across from each other are the same so you would have to multiply those two numbers by two and then subtract that by 360 then divide by two. A parallelogram is the same steps as the rhombus. In a trapezoid its the same thing but the angles that are congruent with each other are horizontal instead of across. Write the top and bottom number for each ray-read carefully!